Multiple options available for all your beverage needs! Ask just about any parent and they’ll tell you at some point, they had an extremely hard time getting their children to drink the appropriate beverages needed to stay healthy. Whether that drink was milk or water, almost all kids seem to show reluctance about anything that doesn’t taste good or have sugar, which has been one of the ongoing battles parents have fought for decades. Well, what if there was a simple solution to that problem, using affordable products both kids and parents will love? By implementing items from Jerry Leigh’s collection of Disney drinkware into your kitchen, you can easily encourage kids to drink needed fluids, by enticing them with cups featuring their favorite Disney characters. 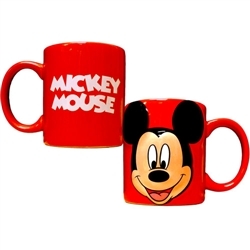 If your child loves Mickey & Minnie and not drinking their juice, the Mickey 3D Head Tumbler or Minnie 3D Head Tumbler are fun enough to excite both boys and girls into actually wanting to empty their glass. Or, if you’re on the go and that little one in the car seat won’t hydrate themselves, the acrylic SpongeBob Happy Face Travel Mug radiates fun and should help ease them into actually listening for once. Heck, you yourself might even need some encouragement at work to gulp down that last cup of coffee. Well, finishing up a boatload of work will be much easier to bare when that cup of java is in a classic Goofy Full Face Relief Mug.